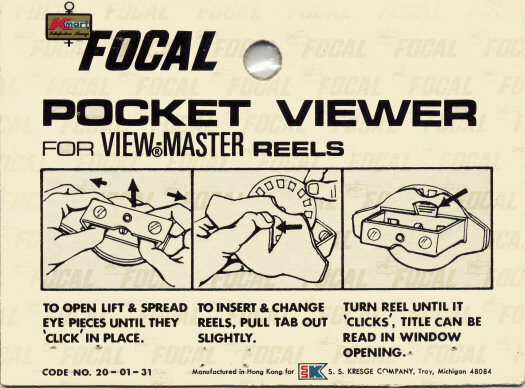 Manufactured for Kmart by Prodev Ltd. specifically for viewing View-Master reels. 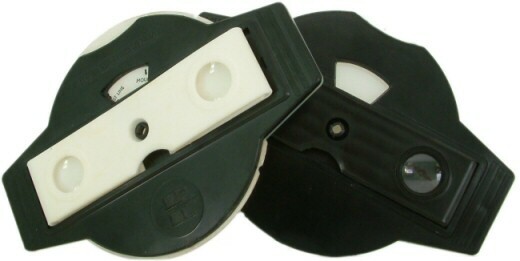 This small plastic viewer folds flat when not in use. The reel is inserted by pulling back a lever and slipping the reel in from the top, the reel is then advanced by hand. The viewer works well when pointed towards a fairly bright light-source. Virtually identical to the Focal viewer above, except that this one was manufactured in 1971 in Czechoslovakia by Film Laboratory Gottwaldov (renamed in 1989 to its original name, Zlin). Although it is an unconventional design it works very well. The word "NEPRODEJNE" printed on the front is Czechoslovakian for "NOT FOR SALE", signifying that this particular viewer was a demonstration model.